One product I never needed when my daughter was a baby was a baby carrier. She loved being held but she was also content with playing on the ground by herself if I needed to wash dishes or fold some laundry. Also she is my first so when she was a baby I could hold her all day if I wanted because I did not have any other children at the time that I needed to watch over and share my attention with. With my son it was a whole new story. From the first day after getting home from the hospital I could tell he was going to make things difficult. He loved and still loves being held as much as possible and I love that he is such a snuggly baby but it is hard when you also have a two year old you need to chase around the house and park and everywhere you go. So I knew immediately that I NEEDED a baby carrier for my son. I looked around for a few months and finally found a carrier I thought would be perfect for my son and myself, the BityBean. The BityBean is one of my new favorite products. It comes in great colors, I love the blue that mine is. It is easy to put on even if you are by yourself. 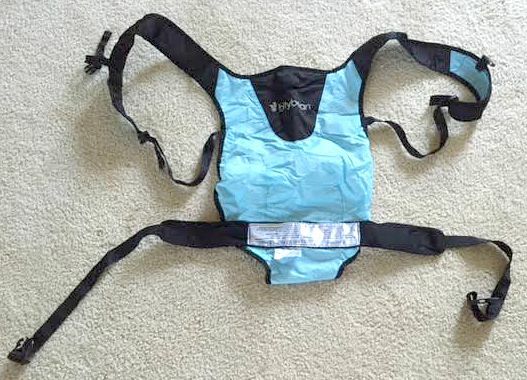 All you have to do is clip the bottom strap around your waist and put one of your arms in, place your baby in and put you your other arm in and clip one more strap right in-between your shoulders. I love how compact the BityBean is. It fits perfectly in its pouch and that makes it very easy to keep it on hand all the time. It is also lightweight and very breathable for the baby so that they don’t over heat while being so close to your body. One of the things I was worried about when looking for a baby carrier was that I wouldn’t be able to find one that would work for me because I am only 5 feet. 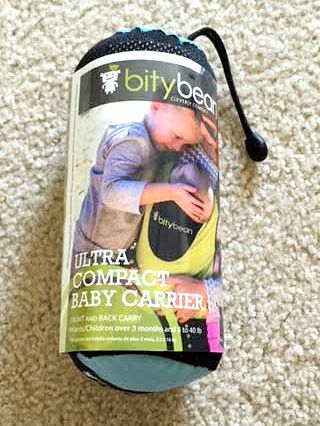 Because the BityBean is so light and flexible it is so easy to fit my son in the carrier but for it to also fit with the length of my body. One of the best features about this product is it is waterproof. This is great news for my family because we go to the lake a few times every month during the summer and sometimes to pools to help cool off during the hot Georgia days. 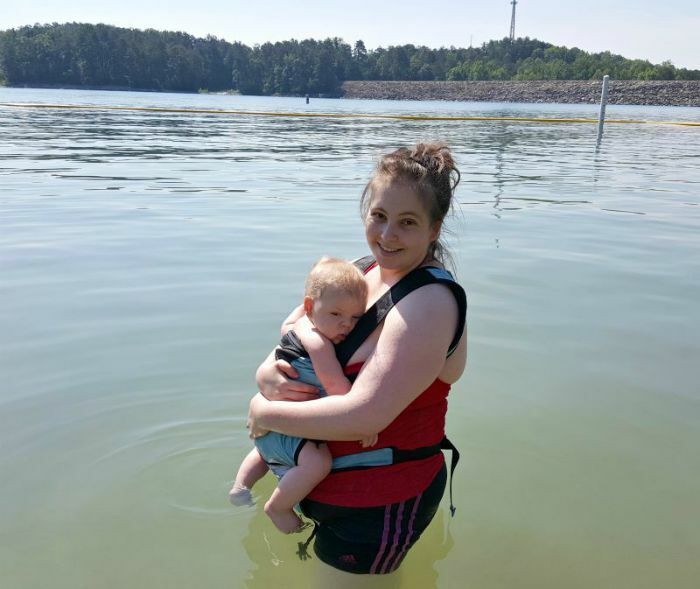 It was so much easier being able to keep myself stabilized while in the water while having my son in the BityBean and be able to use my hands to block the sun from my son’s eyes, because I don’t have the BityBean hood yet. I also loved being able to just throw the BityBean in the washer along with our other lake attire. Now that it is no longer summer this will still be a great product to use at the grocery store, I used it just the other day because my son didn’t want to sit in the cart, on hikes, at the mall, at indoor pools and so many other places. I am so happy that I have the BityBean. The only thing I do not like about the BityBean is that I cannot put my son in it facing forward while it is positioned on my front, I know he would love to be positioned this way. It is however able to be positioned so he is facing forward while the BityBean is on my back, I have not tried this yet because I don’t think he is old enough but when the time comes I think this will be a great way for him to be able to see around while I can chase my two year old around, especially while at the park. Would you like to win a BityBean? If so you are in luck! BityBean is hosting a giveaway right here for the I Love My Kids Blog fans. To enter the giveaway fill out at least one of the entries in the rafflecopter below and is open to those who are 18+ and in the US only. The giveaway ends 9/17 at 12:00 am and the winner will be contacted by email and will have 24 hours to respond or a new winner will be chosen. Good luck! Congrats to our winner Stacey Roberson! Stacey, you have been emailed and have 24 hours to reply or a new winner will be chosen! My favorite feature is how small it packs up and how light it is. I love how compact it is and that it’s water safe! It would be the perfect diaper bag carrier! How small and convenient it is! I like that it is compact. I like even more that it does not have a million confusing straps to try to use. Have aways wanted one and now that i have my 2nd baby i need to get one of these! I love How it folds up for easy storage. Space is always an issue in my house. My favorite feature is waterproof! This would be Heaven sent with 10 week old twins it would make carrying both babies at the same time so much easier! I love how simple and compact these carriers are. Being waterproof is also a huge plus! I love that it is compact and leight weight. I love how compact it is and how easy it sounds to use. I love how compact it is! A baby carrier that fit in a pocket on the diaper bag would be amazing! I love that it’s water safe! Looks easy to use, there is a back carry option and it holds up to 40lbs! My favorite feature is that it can be used in water. With three kids three and under any trip to a body of water is nerve racking. This would be so convenient. love that the bity bean is waterproof. Thanks for introducing me to a new carrier that I’ve never heard of! I love that this one is allowed in the water. We live near the beach and with 4 older sibs, my 4 month old wouldn’t have as much fun unless I had a safe way of introducing her to the water! I love that it’s waterproof and compact!! My favorite feature is not having to worry about getting it wet. I love how light and packable it is!! perfect for quick trips and hot days! It’s hard to pick my favorite feature of the BityBean carrier. I love how compact they are and that they are water proof. Both of those things are absolutely amazing! I love love love the fact that you can use it in and out of the water!!! I need one of these I my life!